Screw Gun vs Drill: What is the Difference? At first glance, screw guns and drills can appear very similar. Because of the similarities, it can be hard to figure out which type of tool is the right one for you when you shop online. Product descriptions aren’t always straightforward, and we all know that the advertising department is fond of inflating what their tools can do. We think that shouldn’t be the case. This guide is designed to show you the differences between these tools, as well as show you the pros and cons of each tool. Armed with that information, you should be able to find the tool that makes your next project fast and easy and comes at a price that justifies the investment. The screw gun does only one thing, but it does that one thing very well. As you may have guessed, a screw gun drives screws and doesn’t do anything else. It looks a lot like a drill, but it only comes with one bit, which is contained within a large chuck. The big upside to screw guns is that they allow you to set the depth to which you’re driving your screws. While driving a screw in too deep isn’t always a problem in construction, there are a few applications where it can cause serious problems. If you drill too far past the first layer in drywall, for instance, you can compromise the integrity of the entire sheet. While it may not fall down immediately, it may cause cracks a few years down the line. That’s why the depth adjustment with a screw gun makes it many people’s go-to tool for hanging sheetrock. Screw guns tend to have higher speeds and lower torque than drills, which helps you drive the screws to the perfect depth. Some high-end models come with self-feeding belts so that you can drive lots of screws without having to add a new screw each time manually. That can be a huge time saver for people hanging lots of drywall. The biggest problem with a screw gun is that you’re limited with what you can do with it. While some models come with the ability to change out the bit in order to allow it to do different tasks, it has far less torque than a drill, so it’s not going to be able to do many jobs as well. Many drills also come with adjustable torque, so you can customize them to the task at hand, which is a feature lacking in a screw gun. If you’re not going to be hanging a lot of drywall, then you’re not going to be able to get a lot of use out of a screw gun. 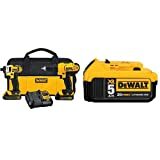 The other major problem is that you can get some of the same functionality out of a drill that you can get with a screw gun with an inexpensive, aftermarket part. You can buy a part for most drills, called a dimpler, which make it far easier to drive screw to a consistent depth with your drill. If you already own a drill, that might be the more cost-effective purchase to make, and it would be far cheaper than buying a drill and a screw gun. Relative to a screw gun, a drill is an extremely versatile tool. You can change a drill to work a different job by changing out the bit that you’re using. Consequently, you can drive flathead and Phillips screws, tighten and loosen nuts and bolts, drill both small and large holes, and even do some more exotic things with the right attachments, like stir paint. That’s only the versatility that you get from a drill due to its interchangeable drill bits. Most drills come with multiple clutch settings. This allows you to run the drill at a lower speed with very high torque, or higher speeds with lower torques so that you can do a wide variety of tasks with equally-good control. Drills also tend to get updated more often than screw guns, which is why you can find far more drills with brushless motors than brushed motors. Brushless motors are more efficient, lighter, run cooler, and have fewer maintenance problems than the brushed motors which preceded them. You can find a variety of brushless motors across a number of brands when shopping for drills. You won’t find as much variety when shopping for screw guns, so you have fewer qualities and price points to look for when shopping for screw guns. The drill is a good example of a jack-of-all-trades tool. While it tends to be less expensive than a number of specialty tools, it won’t do certain tasks as well as those tools would do. A drill doesn’t pack the same amount of power that you could get from a drill press, for example. If you’re looking for the highest amount of power you could get for a certain task, there’s probably a tool that could do it better. When it comes to drywall, the screw gun has the drill beat. Screw guns run at a much higher maximum speed than drills do. Often, they’re about twice as fast as drills, even when using the same amount of power. That means they have far lower torque. While that sound like a bad thing, the lower torque means that you have more control when it comes to driving the screws to the correct depth in sheetrock. Drills also struggle in situations where precision is required. It’s hard to drive a lot of screws in sequence to the same depth with a drill. Instead, it does far better at loosening, tightening, or drilling tasks where precision doesn’t matter. For example, it doesn’t matter how far you drill a hole through a board, as long as the hole goes through the board. When you have large margins of error, a drill performs admirably. When those margins tighten, drills become less useful. We hope that our comparisons of the screw gun and drill have helped you understand the areas in which each type of tool excels. Of course, getting the right tool isn’t as simple as knowing what a tool does well. You also need to take its shortcomings into consideration in order to get a full picture of what a tool can do. As you may have gathered, the screw gun is going to be the superior tool for the person who needs to hang a lot of sheetrock. However, it’s not a very versatile tool, and if you’re looking to do more than just hang sheetrock, you’ll be better off with a drill. The drill is more useful for people who will be doing many different projects. The fact that you can swap out drill bits means that you can dramatically alter what you can do with your drill. If you’re going to need to do a lot of projects in the future that will require different functions, you can’t go wrong with a drill. You can also save some money and buy a dimpler for your drill which will allow you to hang sheetrock about as well as you could with a screw gun.